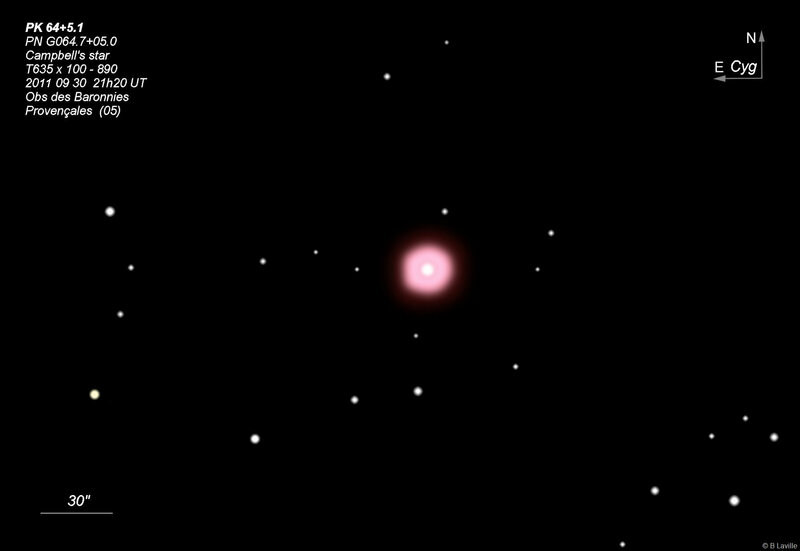 PK 064+05.1 The red blinking planetary nebula! 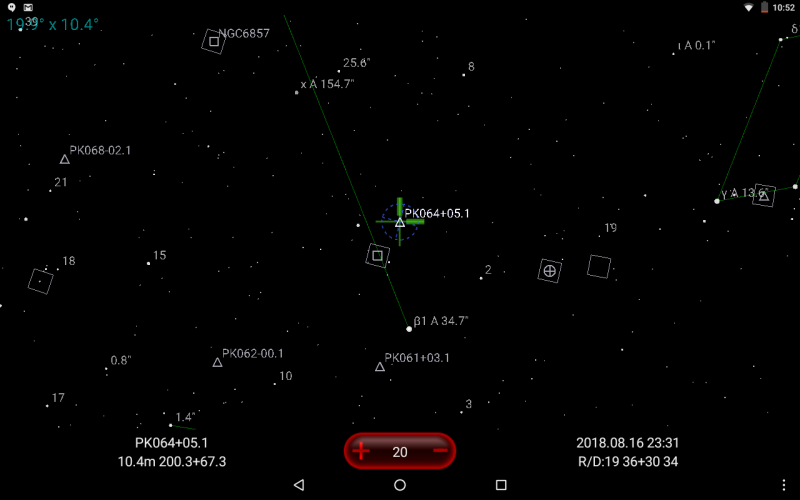 I have hundreds of planetary nebulae tagged in my tablet's DSO Planner but they all appear under their PK designation. 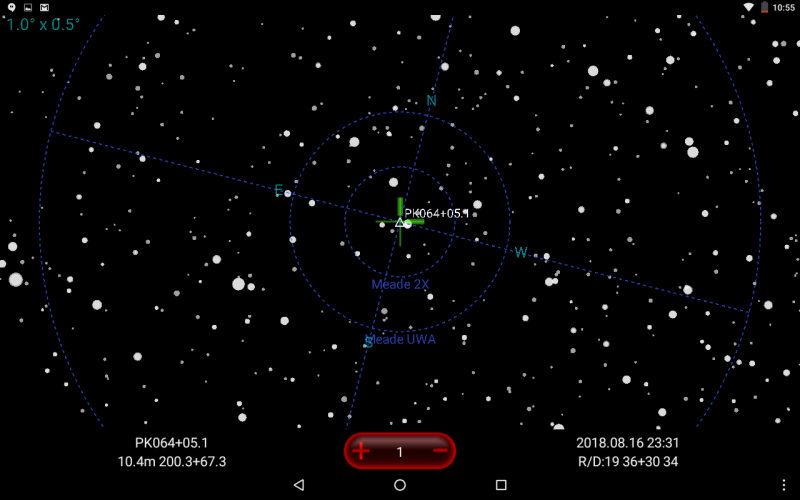 This means you can be looking at a well-known PN but not know it, which happened last week with PK 064+05.1 in Cygnus. It was listed as 10.4 magnitude and at a diameter of 10". 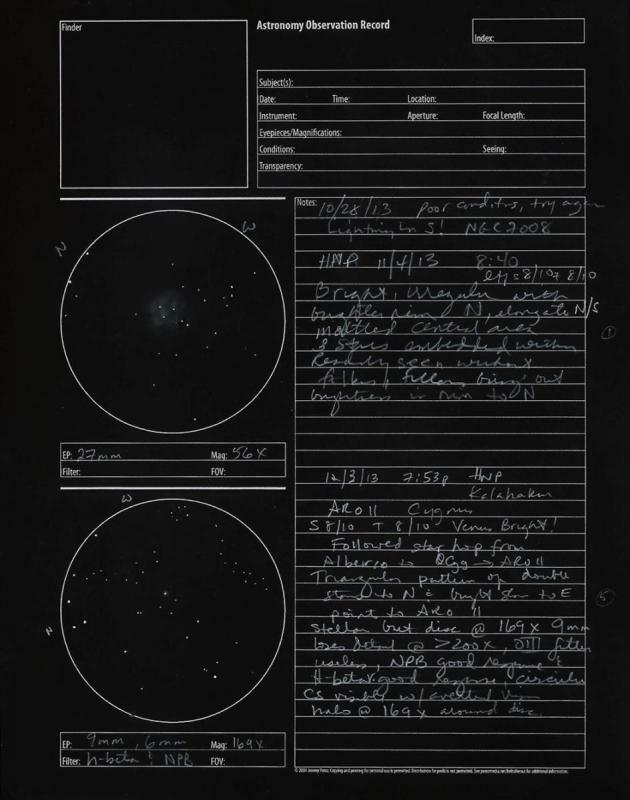 Later I see estimates which place it as bright as 9 mag and 10" refers to the size of the faint outer shell; the main nebula is more like 5" or 6". I was sure I had it somewhere in the 1 degree FOV at 100X but couldn't see anything where I thought it was apart from a red star. Looking at the edge of the FOV the star swelled in size! I realised this was the PN. Moving to 200X, the same effect was repeated: looking directly at the bright star made the nebula disappear. Only at 300X and better still at 600X could the nebula be viewed directly. But it was still red, so how could it be the planetary nebula?? 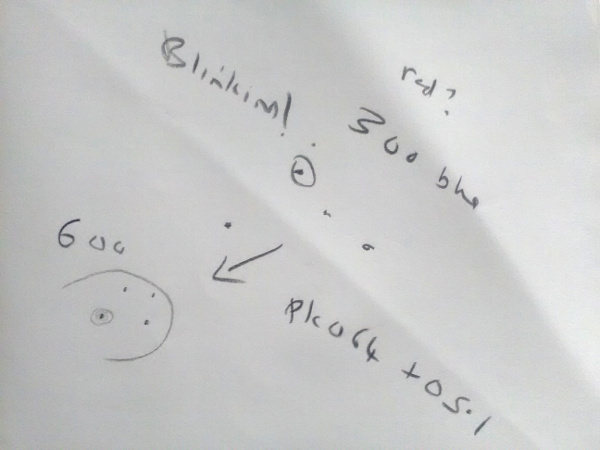 I recorded it as a "blinking planetary" and wrote "red?" even though it clearly was red, I just couldn't accept the evidence of my eyes. To complicate things further, the longer I looked at high magnification the bluer it became. So I recorded it as blue too. I realised later this was due to my eyes adapting to the low light at high power and becoming less sensitive in the red part of the spectrum. When I looked again after drawing the view it was red again. 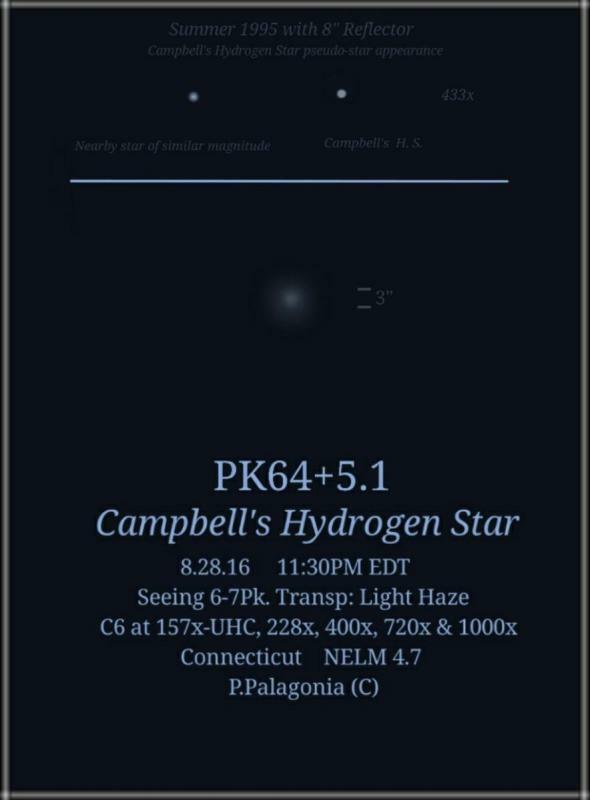 I had, of course, "discovered"... Campbell’s Hydrogen Star. The red and orange hues are caused by a glowing mix of hydrogen and nitrogen gases. I read later that a Hydrogen B filter can reveal the structure of its ring shape, but an observation the following day failed to show anything with the filter even at 900X, so that's a challenge for another day. Here's the view at 300X and 600X in the box, with original notes below. The colour is what I saw at its most intense, which was at 300X. West is towards the lower left corner. Edited by iainp, 18 May 2018 - 05:04 AM. You are knocking these PN's out of the ballpark--er, I mean cricket pitch? 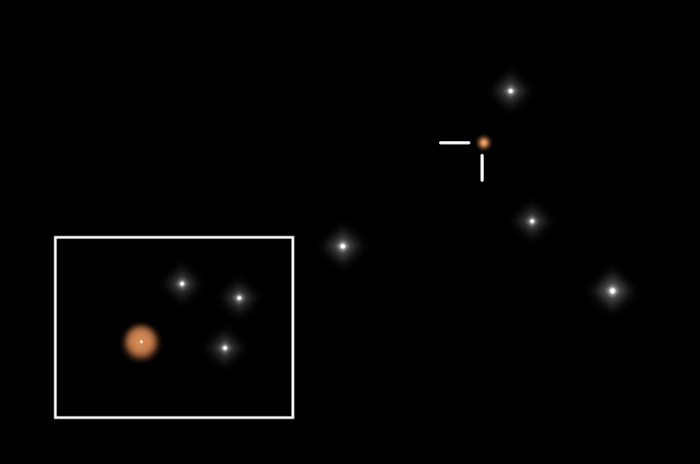 Nice sketch of PK 064+05.1 (The red blinking planetary nebula!) . What a fun observation! I was sure I had observed this but couldnt find it in my notes so it goes on the list. The detailed description of how it it appeared less red at higher power is also interesting. Edited by Warmvet, 18 May 2018 - 02:39 PM. I found it under its other designation in my files, ARO11. I did not note any red but I may have been observing it with a filter at the time. Here is my sketch and notes for interest, absolutely need to go back for another look.. Thanks. Interesting report there Cindy. Look forward to your impressions of colour. I'm just back from a failed session as cloud rolled in, but grabbed another look at this one: clearly red/orange at lower powers, eg 100x, still colourful at 300x but more muted. Tried the H-beta again but no sign of the ring despite rather steady seeing. It really is a very small PN! Im so glad you got this one with the 20. Moreover I think its great you got the red in the star and gas. As youll see my C6 tends to morph the star into the gas. It's like an emergent resolution of both but neither quite there yet and color is ever that slate grey black. Im proud of what Ive achieved with the small scope but your views are most welcome. I knew you'd see more and you delivered. I'm curious Iain, did the nebula ever seem ring-like around the star? Incidently, my UHC did enhance the nebula but the winner was highpower over lower power filtration. I did try 1000x (lol because I could) but the lower über powers proved better. Edited by azure1961p, 19 May 2018 - 10:50 AM. Hi Pete, I'm amazed what you managed to pull out of such a tiny object given the aperture you were using! Re the ring, there was not a hint of it on any of the 3 occasions I observed this. The H-beta filter added nothing, only dimming the view right down, and even at 900X there wasn't a glimmer of a ring, despite my knowing by then that there "should" be one. What stood out for me, apart from the colour, was that it seemed to have a fairly clearly defined edge rather than a 'fuzzy fade out'so common on PNs. And the star remained clearly delineated from the nebula even at high magnifications. PS: "the winner was highpower over lower power filtration". That's interesting, as I'm finding that to be the case on almost all the PNs I've looked at through the 20". The only exceptions being the large diffuse ones. Eg. M97 was all but invisible without filter last night, but was quite detailed with both 'eyes' showing with the OIII filter. Edited by iainp, 19 May 2018 - 11:14 AM. Many times I tried to see it, but no result ! But thank you for your subject, maybe it will help me to spot it, I own a 16", I hope it is enough to ! 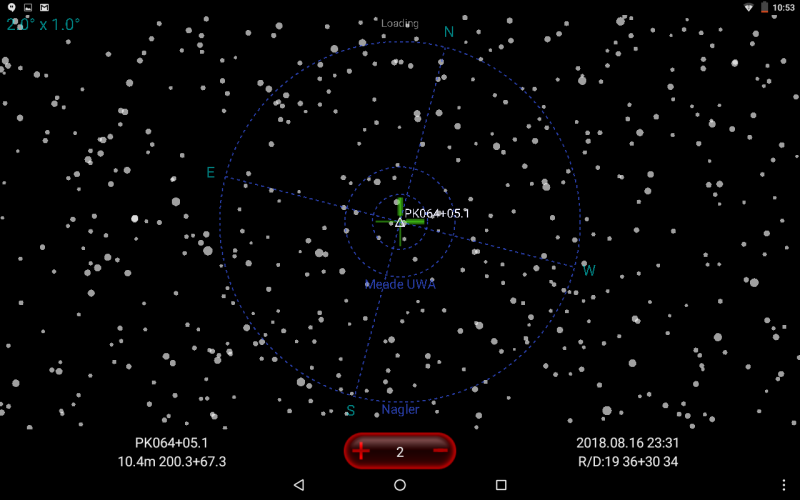 I think it is a recent nova, and we are seeing a proto planetary nebula ? Edited by paradise, 13 August 2018 - 07:18 AM. Good luck with it! Yes a proto planetary nebula, which is why an OIII filter doesn't work on it. You should be fine with a 16"! The 20" collects around 60% more light but it will still be quite easy in a 16" to see it and its colour. See its extended shape is more difficult though. That's an amazing sketch with the 26". Edited by iainp, 13 August 2018 - 09:54 AM. A H-Beta filter could be wise, I guess, cause of the red emissions ? But I'll try first without filter. Anyway, it is my next challenge ! Yes, many report good results with H-Beta filter but it didn't help me at all, perhaps at 900x it just dimmed the light too much. Fingers crossed for you! Thank you, but last night it was again a failure, I couldn't spot this red star. Manually it is not easy, I only use Skysafari. But I'll try again and again ! This is a worthwhile target for tracking down. Your sketch and others here show that.. I need to track this one down. Thanks again Frank. Hope you get it too and pull out some colour in it. I've tried it again on a couple of other occasions and it didn't look nearly so red, more like a slightly salmon coloured star. It's a tricky one for sure! Edited by iainp, 21 August 2018 - 01:02 AM. I was out the night between Friday and Saturday with my 20", I used 498x and the seeing was unsettled, in the range 2-4 arcseconds. To my eyes, the central star and the bright part of the nebular was a very special amber color. Not like an orange star, but something else and I think the best description of the color is amber. Edited by Tom Axelsen, 21 August 2018 - 05:46 AM. I read about this object in the new NSOG volume 4 (Kepple). So in the night of 7.august 2018 near Ustrine on the Island Cres I observed it. I used the 16" Dobson with 200x and 257x. The sky was hazy. I saw the star covered by the round nebulae.